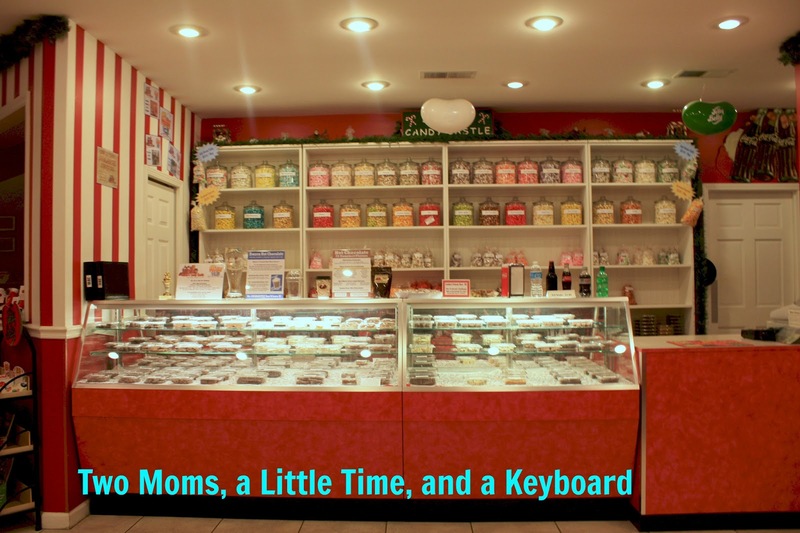 A Little Time and a Keyboard: Christmas cheer all year in Santa Claus, Indiana! Christmas cheer all year in Santa Claus, Indiana! 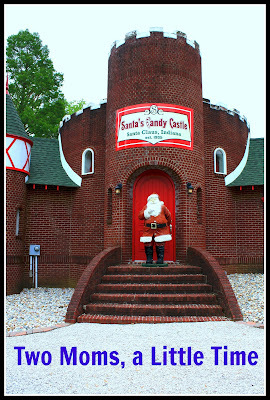 While researching holiday activity ideas last Christmas, I learned about Santa Claus, Indiana. 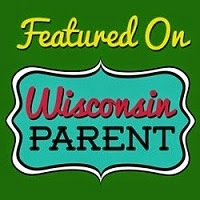 A town named after Santa with fun Christmasy things to do throughout the year! Too much fun! Several months later, I visited Santa Claus, Indiana and witnessed its holiday magic for myself. The town is truly spirited, with Christmas flair spread throughout from the sites to the decor to the names of the streets. Christmas all year round is definitely a dream for many children! Santa Claus delivers special Christmas magic to all who visit! The Santa Claus Museum and Village is the perfect place to start when visiting the spirited town. You are probably wondering how Santa Claus obtained such a fanciful name. Well, you will learn this and much more at the museum. 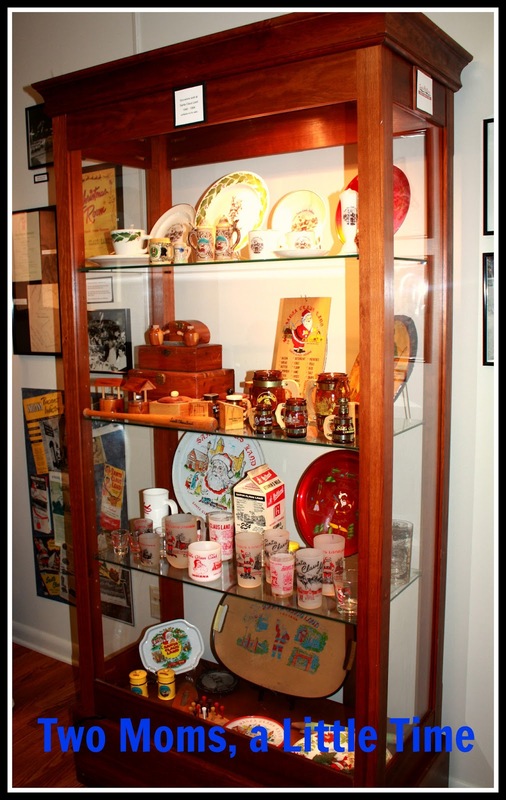 The museum has quite a collection of documents, artifacts and photos pertaining to the history of Santa Claus, Indiana. We enjoyed taking some time to peruse the curios and look through the photos documenting Santa Claus history. We also enjoyed watching a video about Holiday World, the theme park making its home in Santa Claus. The Museum truly acquaints visitors with the town. 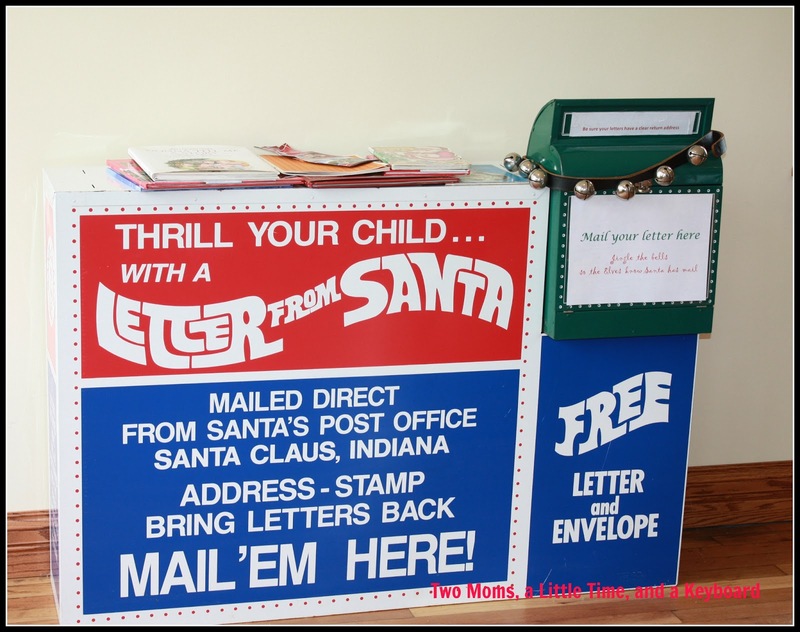 On the museum grounds, kids love to visit the Post Office to write letters to Santa. My daughter enjoyed writing her letter to Santa. 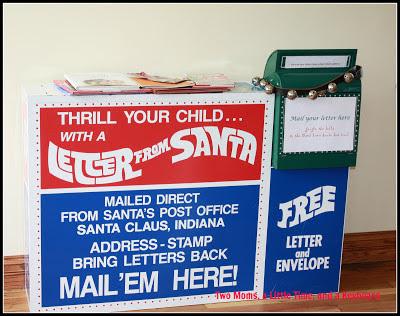 After putting her letter in to a mailbox, she gingerly rang some bells to alert the elves to the new piece mail! One day in the future, my daughter will receive a surprise message from the big man himself! 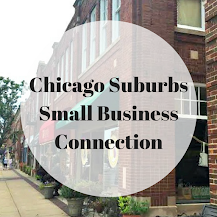 In addition to the Post Office, you will find a charming stone statue of the jolly St. Nick. Also, you will discover a church built in 1880. Daily tours of the church are available, so you will want to check in the museum for details. The museum is free. However, donations are welcome to help finance Santa's letters. After visiting the museum, you may have the urge for something sweet. Nearby, you will find Santa's Candy Castle. Santa's Candy Castle is full of sweets for everyone. With so many sweets, what could Santa's Candy Castle be known for? When visiting, do not miss trying one of the hot cocoas or the frozen hot cocoa. The Candy Castle has many unique blends of hot cocoa to choose from. We enjoyed the dark chocolate raspberry. Divine! There is more to the Candy Castle than treats! While at the Candy Castle, the kids can live chat with elves at a computer station (for a charge). After the chat, the kids will leave with documentation that they are on the "Good List." Also, have fun browsing the decor and using the candy machines. Unfortunately, the candy machines were not functional when we visited. The Candy Castle has a large collection of Christmas books. Christmas books always make nice gifts! What is a Christmas themed town without a Christmas store? The Santa Claus Christmas Store wowed us from the moment we walked in. The store is quite literally bursting with ornaments. Everywhere you look--from ceiling to floor--there is a little holiday surprise. My daughter was in heaven when she found the nutcrackers. 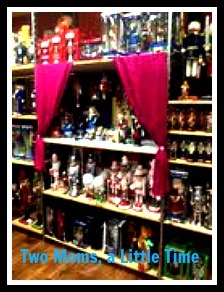 She spent quite some time studying the wall--yes, entire wall--of nutcrackers! If your sweet tooth is nagging you while visiting, you can stop for a little fudge and then continue exploring. The Christmas Village section of the store is spectacular! This past Christmas, we had fun visiting model railroads and we each tried to out do each other with identifying miniature details. So, we delighted in looking at all of the details in the Christmas Store's village section. If you are visiting Santa Claus, Indiana, I recommend working on some of your Christmas shopping while at the Santa Claus Christmas Store. With nearly 5,000 ornaments, the store really does have something for everyone. Plus, from Star Wars nutcrackers to pieces for a Williamsburg Christmas village to a motorcycle Santa, you can easily find a personalized gift for someone special in your life. We enjoyed our visit to Santa Claus, Indiana. 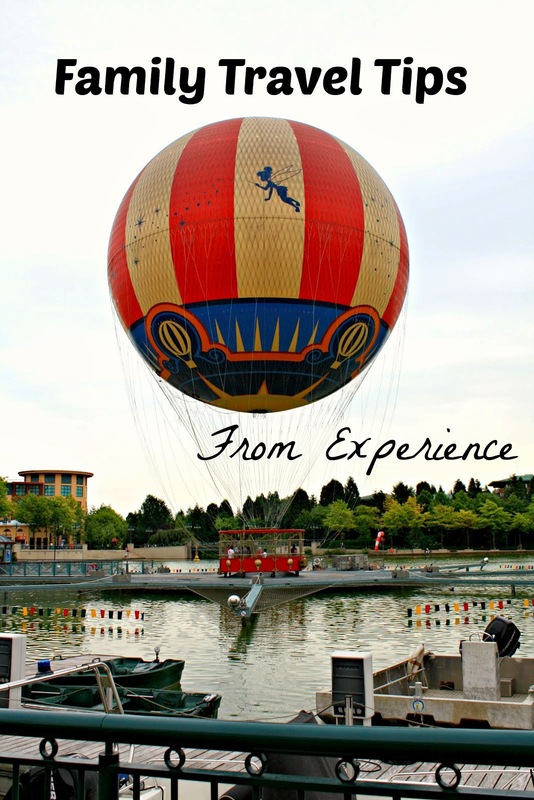 Being able to enjoy some Christmas magic in the summer is definitely a treat to kids young and old! 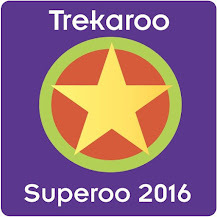 For more on what we did in Santa Claus, please check out my Trekaroo reviews. Thanks for the advice! This will really help me plan our upcoming visit to Santa Claus!